Words can’t express how grateful I am for all the support I have received these past six weeks. It’s so comforting to be surrounded by an army of dog lovers that speak the same language and just get it. I’ve found great healing when reading all the heartfelt comments on my tribute to Sanchez and in personal emails and Facebook posts. Thank you! Today would have been Sanchez’s 14th birthday. While I had been hoping to be partying with him, I am instead honoring him by celebrating his life. 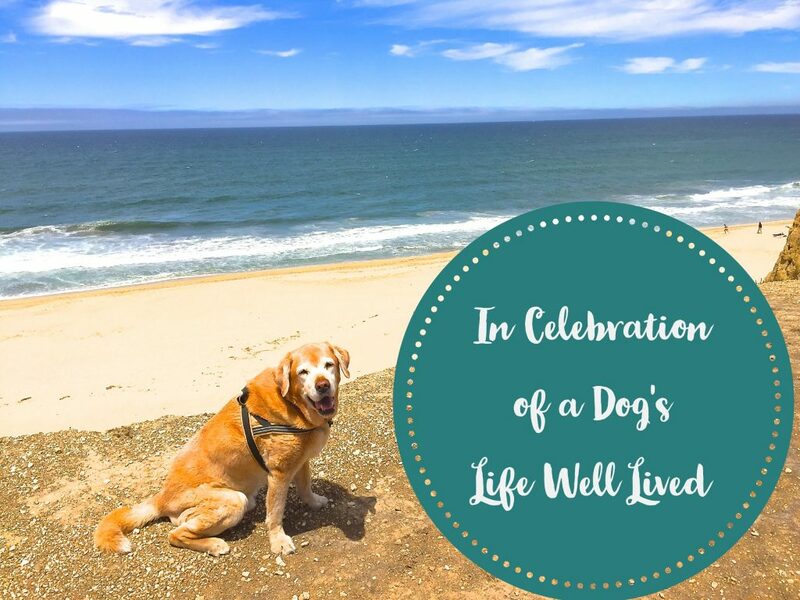 It was a dog’s life well lived. A few days after his passing, I recorded the video above. I chose the Lento from the B flat minor Sonata of Chopin because it’s one of my personal favorites from iCalmDog. It represents ascent into heaven and was very healing for me. The music reminds me that Sanchez will always live on in my heart and in the music that he inspired. I am eternally grateful. Party on at Rainbow Bridge Señor Sanchez! I know there are no words that can help relieve the loss you are feeling, please remember you have so many that can relate and let the happy memories keep Sanchez close to you. Athena passed 1.5 years ago and every day I well up and have yet to be able to say her name without crying. We love all of our 4 legged family but some touch our hearts in a way that no words can explain. I’m so sorry for your loss Cecelia. Yes, Sanchez’s memories stay close and bring me comfort. And, sometimes there are just no words. The depth of this loss even surprised me. Aw, I imagine Maddie and Sanchez found each other already. Sanchez always really liked dogs bigger than him. And, that’s a cute visual of Maddie shaking a balloon. Happy Birthday, Sanchez! Last weekend would have been Lilly’s 13th birthday and Ginko’s 17th. We miss them both so much. I know how much your heart still breaks Roxanne. The depth in us that they reach is just so enormous. Sending hugs. Thank you for sharing Sanchez with us. Tears finally flowed when I saw him running across the beach towards you…Despite tears that must fall, he blessed you with his deep affection and you blessed him with the opportunity to live a rich, full life. Thanks Kerry. That run on the beach is probably my favorite part. I filmed that on his 12th birthday, and he was just so happy. I’m so grateful I was able to give him such a rich, full life. He gave me so much in return. So sorry for your loss of Cinny. She was a lucky girl to have found you. And, yes, they will live on forever in our hearts. Thank you for sharing the video and music. It was a beautiful tribute. Thanks Cheryl. I’m glad you enjoyed it. It was very healing for me to create. He will always be with you. You have both been so very blessed to have each other! Thanks Charmaine. Yes, I feel very blessed. Sanchez rocked my world. They come into our lives and let us be a part of their journey. How thankful I am every day for the time I had with my Baxter. Ten years went by too quickly. I know he will always be looking down, he’s always with me. Sanchez had such a remarkable journey with you, what a blessing they are to us. Thank you for sharing the heart warming video for Sanchez. Thanks Karen. I’m so glad you enjoyed the video. And, so sorry for your loss as well. Baxter was a lucky pup, I’m sure. Donna – What a beautiful quote. How true it is. Thanks for sharing that. I’m sorry for your loss. Nothing hurts more than to lose and pet. Sanchez had a beautiful life with you and will always be with you, as a guardian angel and a loving memory. Remember the love it will help ease the pain. Thanks so much Suzanne. I’m eternally grateful for the love that we share and all the memories over nearly 14 years. I purchased the ICalm in honor of Sanchez seeing the love you two shared was inspiring. It was evident by the love in his eyes he had a wonderful Mom. Now the Angels play your favorites on their harps for him. Blessings on you from Heaven and peace relieve your grief. Karen, that is so sweet. Thank you. I hope you and your pup enjoy your iCalmDog together! Your video & music brought tears to my eyes…so moving! I’m sorry for your loss of Sanchez. I know how hard it is when you love so deeply. I’ve lost 2 dogs & my current greyhound is 11 today. I hope she lives to see 14, just as Sanchez did. Thanks for your beautiful music! So sorry for your loss Lisa. Sanchez will always be a part of you. Take care…. Your video and music celebrating Sanchez’s life are at the same time beautiful and heartbreaking. We would all give ANYTHING in the world for our best furry friends and kids to live forever, or at least every day that we do. You are lucky to have had each other and I am SO very sorry for your loss.